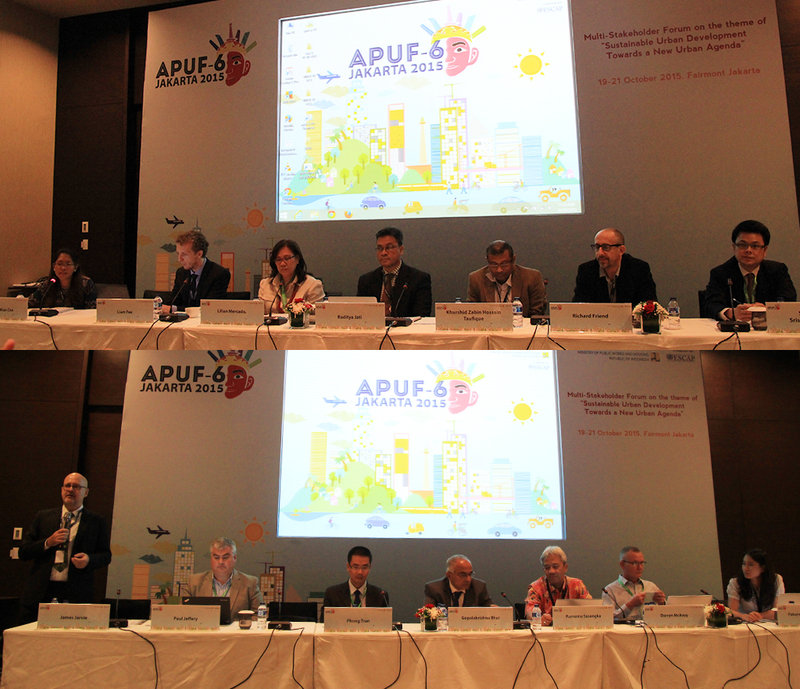 The sixth Asia-Pacific Urban Forum (APUF-6) took place on Oct. 19-21 in Jakarta. This meeting, organized every four to five years through the UN, was hosted by the government of Indonesia and brought together policymakers and practitioners to discuss emerging and critical urban development issues. This year’s forum took place at a pivotal moment, following the recent adoption of the Sustainable Development Goals (SDGs) — an inter-governmentally agreed set of targets that will build upon and replace the Millennium Development Goals (MDGs) — and leading up to the third United Nations Conference on Human Settlements (Habitat III) next year in Quito. APUF-6 provided an opportunity to focus on the reality of the newly adopted 11th SDG that commits member states to: “Make cities and human settlements inclusive, safe, resilient and sustainable”. Half of humanity is already urban, and this level will continue to rise with 95 percent of future expansion happening in the developing world by 2030. The SDG 11 presents a call for action by 2030 to ensure universal access to adequate, safe and affordable housing and basic services; to enhance inclusive and sustainable urbanization and capacity for participatory, integrated and sustainable human settlement planning and management; and to increase the number of communities adopting and implementing policies that embrace inclusion, resource efficiency, mitigation and adaptation strategies that enable resilience to climate change. Asian countries will have their work cut out in achieving the SDG 11. Asia is economically powerful, but its “resilience” has become increasingly exclusive, primarily benefitting the wealthy, and to the detriment of the poor, thereby dramatically escalating inequality trends that are all too apparent across the region. More inclusive approaches that take into account the poor and marginalized members of the community (such as the almost 1 billion people that already live in slums) are likely to face an uphill battle, due to growing political challenges in the region. For example, recent laws restricting the ability of NGOs have been passed in Cambodia and India, harming the constituencies they represent and constraining the voice of civil society. Furthermore, decentralization appears to have stalled across the region. In Jakarta, the controversy in Kampung Pulo attracted international attention regarding the rights of untenured citizens in Indonesia. It is hard to reconcile commitments to urban inclusion when the political space is constrained. Across Asia, we have seen many examples where urban governance is failing to meet growing demands. The floods that devastated Thailand in 2011 were the result of heavy rainfall, but the impacts were compounded by a history of land use planning that allowed industrial estates and residential areas to be built in areas that naturally flood, such as wetlands and agricultural land. Air quality in many Asian cities is already far worse than levels considered safe, and it is often poorly monitored. The haze problem has been a human and policy issue for almost 20 years, yet forest fires still harm public health and close public services in urban centers here in Indonesia, as well as in Malaysia, Singapore and Thailand. Traffic congestion is now emblematic of Asian cities, again as a result of poor policy and planning. The impacts of these failures fall mostly upon the poor, the elderly and the sick. The APUF-6 provided lessons on how SDG 11 offers hope for moving forward. As the newly released “State of Asian and Pacific Cities 2015” report clearly points out, cities where there is an open dialogue with transparent and accountable government are those most likely to have successful and sustainable futures. Strong regulatory frameworks that dovetail harmoniously with market forces allow public systems and services to be funded and to be accountable and accessible by all. With huge inbound investments into Asian cities, there is an urgent need to strengthen the regulatory role of local government to protect environmental and health standards and to ensure that decisions that affect city residents are made in ways that are openly responsible to the public. The pressures from climate change are intensifying and it is clear that urbanization in the future will need to diverge significantly from current trajectories. As UN Secretary-General Ban Ki-moon has said, the struggle to avoid global climate catastrophe will be played out in cities. With Asia representing the most rapidly urbanizing area of the world, the region will require a new vision and new solutions. The Asian Cities Climate Change Resilience Network (ACCCRN) and its partners have supported city governments and citizens to take action to build a new urban future that is inclusive and resilient to climate change. At the heart of this process is a need for strong commitments to social and environmental justice — where much needed city investments can be made in inclusive, transparent and accountable terms. As urban citizens, we should all have the right to cities that are healthy and safe and with productive urban environments that offer access to public spaces that inform citizens and allow participation in the decision-making process. The aspirations of the SDG 11, along with the policy advice and dialogue generated by APUF-6, are set in the harsh and challenging context of Asian urbanization. However, there are examples of actions, people and processes that give cause for hope and can be further recognized and built upon. For all of us living in Asian cities, there is a duty to become involved — to build safe, inclusive and accountable futures for everyone. Jim Jarvie is Mercy Corps’ network director transitioning the Asian Cities Climate Change Resilience Network (ACCCRN) to a practitioner-based membership platform. Richard Friend is director of the ISET-International Regional Office, Thailand. This entry was posted in Climate Change, English / Tiếng Anh, urban planning, Urban resilience and tagged APUF6, Asia-Pacific, Climage Change, flooding, resilience, SDGs, Urban planning. Bookmark the permalink.